A small village on the road from Boncath towards Cenarth and Newcastle Emlyn. Part of the village strays off along the edge of the Cych Valley on the minor road leading towards the Teifi Valley, Llechryd and Cilgerran. In the other direction, upstream of the bridge, the branching and beautiful Cych Valley extends for more than 10 km southwards. It is thickly wooded and steep-sided, and it remains somewhat mysterious and unvisited to this day since there are few decent roads. Perhaps we should not be surprised that somewhere in this wooded wilderness, according to the Mabinogion, there is the entrance to the Otherworld. 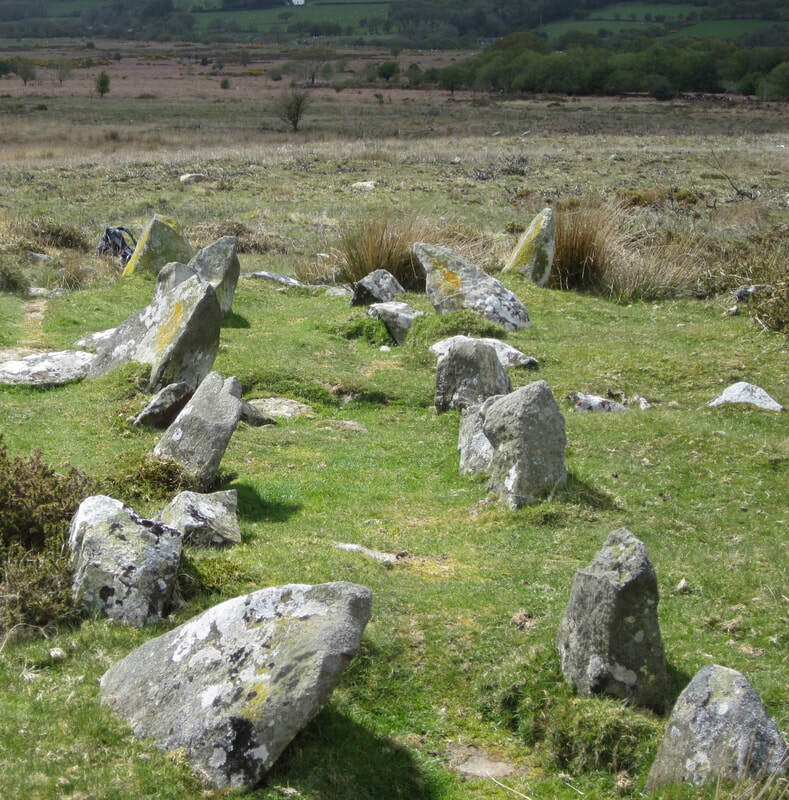 Pwyll, the Prince of Dyfed, went stag hunting here, and became involved in a very complicated adventure by changing places with Arawn, the Prince of the Otherworld. 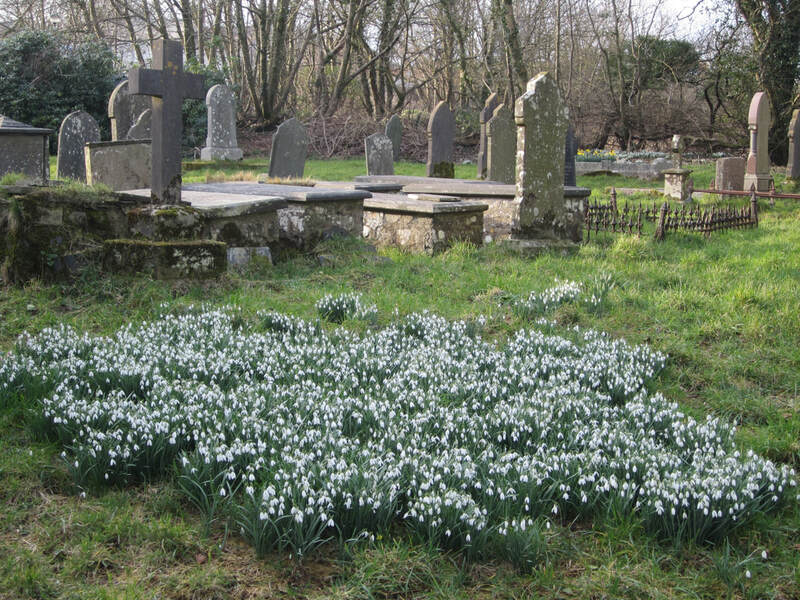 ​A ramshackle and charming village (Treamlod in Welsh) built round a raised circular churchyard which looks as if it might be a prehistoric sacred site. (Many early churches were built on prehistoric burial mounds -- in other words, on sites that were already revered at the time of the introduction of Christianity.) The most interesting thing about the church is the massive squat castellated "Norman" tower which would not look out of place if it were built into one of the Pembrokeshire castles. It was given its final form in the 1400's. This reminds us of the fact that Ambleston was, in the Middle Ages, on or very close to the Landsker -- the line which divided the Norman-colonised south of the county from the more rebellious north, which remained largely under the control of the Welsh princes and the Bishop of St David's. But there were many ferocious raids back and forth -- hence the need for fortified churches which could act as the last places of refuge, if needed. 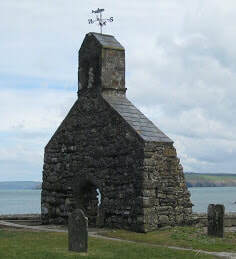 In contrast, the great majority of the parish churches of the Welshry do not have towers, but simple bellcotes instead. ​The name of this village (on the old road from Eglwyswrw to Cenarth) comes from the Welsh word for buzzard, "bwncath". It was recorded on a pre-1850 historical parish map as in the parish of Llanfihangel Penbedw in the Hundred of Cilgerran. The old parish church, which dates from 1325 or earlier, was restored in 1859 but fell into disuse in the 1970s. Part of the village lies in Capel Colman parish. The Boncath Inn (formerly Tavern) has stood here at least since 1862. Boncath developed into a larger settlement when the Whitland and Taf Vale Railway was extended to Cardigan in 1885. The railway station, opened in September 1886, was a two-platform stop between Crymych Arms and Cilgerran Halt on the Whitland and Cardigan Railway, known as "Cardi Bach". The line was closed due to the 1963 Beeching Axe and the station building became a private residence. Now, with just one shop to serve the community, the village maintains a relatively prosperous appearance. This is a scattered village on the Crymych road (A478) heading south from Cardigan. It's about a mile west of Cilgerran. The main feature of interest is the substantial mansion called Plas y Bridell -- once a rather grand gentry house, and more recently used as a care home for the elderly. There is a terrifying tale from the village. 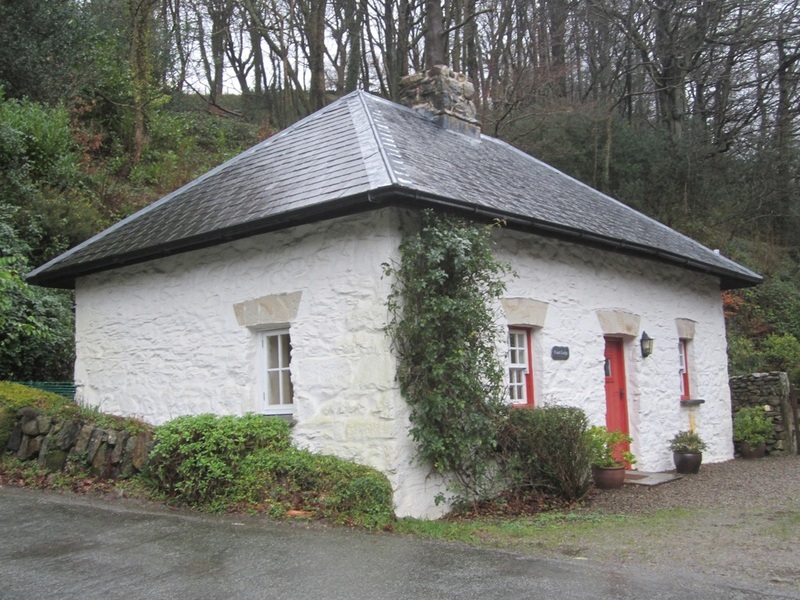 This was one of the last places in Wales where the tradition of "Hirwen Gwd" was practiced -- in which, during the wake before a funeral, the corpse of the deceased person would be hauled up the chimney on a rope, thereby allowing his/her spirit to leave the house. In 1760, during a prank which went horribly wrong, a young man who had drunk far too much for his own good climbed into the empty coffin while his friends were hauling the corpse in its white shroud up the chimney. When they returned to the coffin afterwards to replace the corpse, they found that their friend had died...... and nobody ever did discover the cause of death. This is a small village within the cultivated area below the northern flank of Mynydd Preseli. Nowadays it's just a cluster of houses and farms, with a village hall in the old school a little way from the village centre. 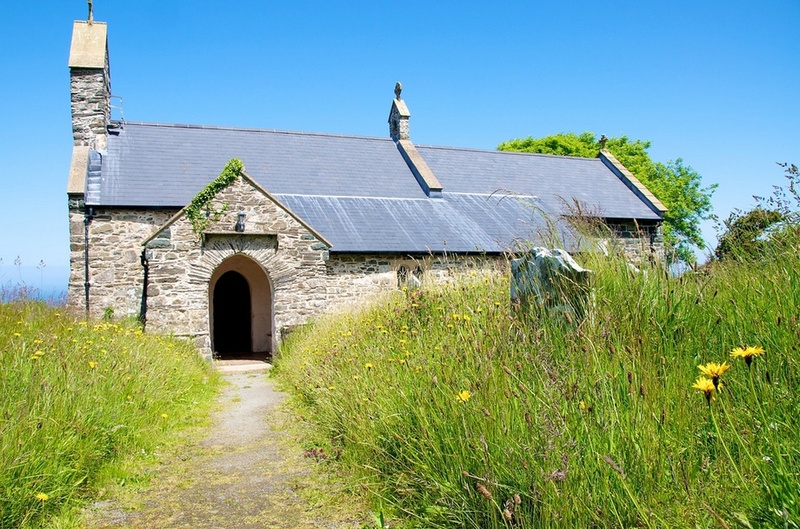 The most notable building is Brynberian Independent Chapel, built in 1842, with a three-sided gallery. This chapel features strongly in the novel "Flying with Angels". This is where the last love of Martha's life, Amos Jones (Jones Minor Prophet) is called to be minister, and where -- in one of my favourite episodes from the novel -- Amos is confronted with a demand for him to be "cast out" following his misdemeanour in the woods with Martha! Cardigan is at attractive town located on the banks of the River Teifi, about 3 km inland from the estuary. A castle was built here by Robert Montgomery in 1093 after the Norman army conquered Ceredigion, but the area was regained by the Welsh in 1136 and held until 1164. Under later Welsh rule a castle was built in stone with a walled settlement around it and in 1176 Lord Rhys instituted the first eisteddfod. Contestants came from all over Wales, England, Scotland and Ireland to compete for chairs in music and poetry. In 1199 the town received its first charter and became an important trade centre. In 1227 a weekly market was established which continues to this day. Welsh rule over Cardigan continued, for some periods under royal lordship, until it was annexed to the English crown in 1283 when the county of Cardiganshire was created. The town wall was built in the 1240s and the castle was rebuilt. St Mary's church was established as a Benedictine Priory and parish church in mediaeval times and survived the Dissolution of the Monasteries. The castle ceased being the administrative centre of the county with the Act of Union in 1536 and by the early 17th century was already falling into ruins. Until the 16th century, Cardigan had been a small, walled town with some river traffic. With Wales formally annexed by England, political and domestic stability boosted economic prosperity through the increase in maritime trade. At 1600 the port's principal trade was fishing, but over the next century trade expanded to include a range of imports and exports, and a Customs House was established to collect revenues. The herring fishery developed and then declined. By the beginning of the 18th century there was a large merchant fleet. Exports included herring and salmon, slate, bark for tanning, corn and ale. Imports included oranges, manufactured goods, building materials and coal. Industries that developed included shipbuilding, brickworks, a foundry, ropemakers and sailmakers. 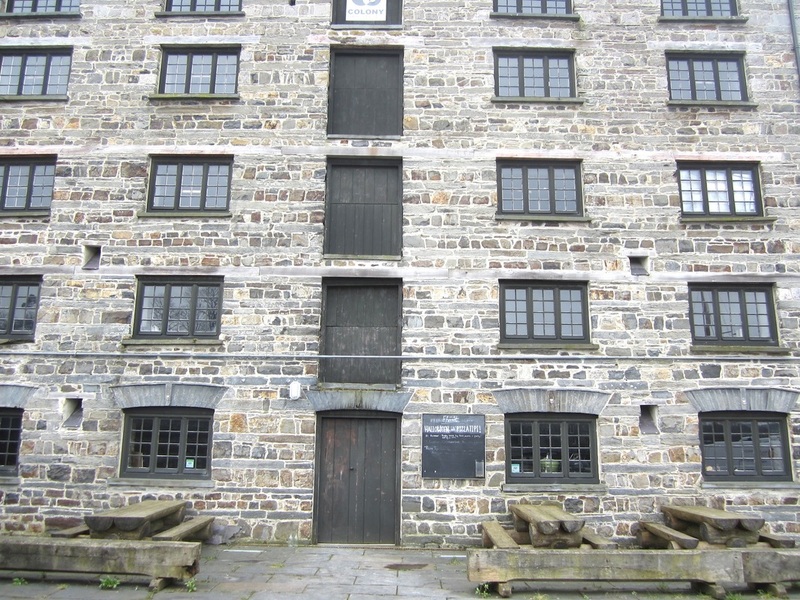 In the 18th and early 19th century, Cardigan was the most important port in South Wales. In 1815 it possessed 314 ships totalling 12,554 tons. This was seven times as many vessels as Cardiff and three times as many as Swansea. It also had a thriving shipbuilding industry, with over 200 vessels being built both in Cardigan and downstream in the village of Llandudoch (St Dogmaels). The Guildhall, built in a Gothic design, and opened in 1860, was erected on the site of the 1804 grammar school. By the mid 19th century there were more than 60 taverns in the town. But the port began a decline, hastened by the coming of the railway in 1886. The river silted up and larger vessels could no longer reach the port, which had largely become inactive by the early part of the 20th century. Plans for dredging came to nothing. Nowadays there is something of a renaissance in the town, with a vibrant cultural centre in Theatr Mwldan, and with the opening (after a campaign of many years) of a much renovated Cardigan Castle. As with all of the other settlements of west Wales, tourism is of great importance to the modern economy. ​Cenarth lies near the junction between the three counties -- Pembrokeshire, Ceredigion and Carmarthenshire. The ancient parish extended for 5 km south of the river, and included the town of Newcastle Emlyn. 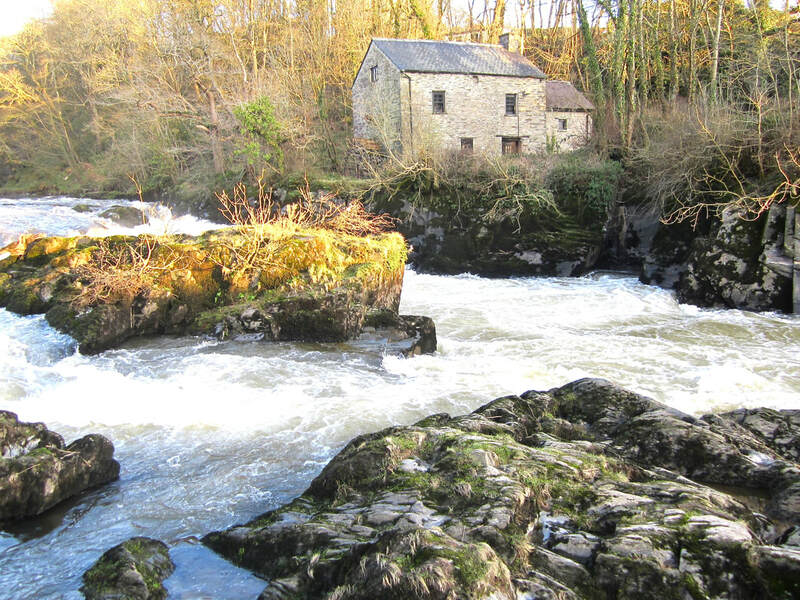 The River Teifi at this point emerges from a deep ravine over a ledge that produces a spectacular waterfall when the river is in full spate and this attracts many visitors throughout the year. A dramatic painting of the falls was made by Frank Miles and is now at Nottingham City Museum; but since this is a photographers' and artists' paradise there are in truth many wonderful portrayals of the falls and the adjacent bridge. Cenarth Bridge was built in 1787 by William Edwards of Eglwysilan and his son David. The bridge features their trademark series of circular holes that allow the weight of the structure to be reduced without losing strength -- and also allows extra water to pass through at times of exceptional floods. Other visitor attractions are a seventeenth-century flour mill and the National Coracle Centre. The parish church is dedicated to the local saint, St. Llawddog. Although the present building is relatively modern, it is on an important ancient site, and there has probably been a church here since the Age of the Saints. T​he village of Cilgerran owes its origins to the castle, built on a rocky spur high above the River Teifi. This is the castle from which Owain of Powys is said to have abducted Nest in 1109, although at that time it would have been a wooden structure. 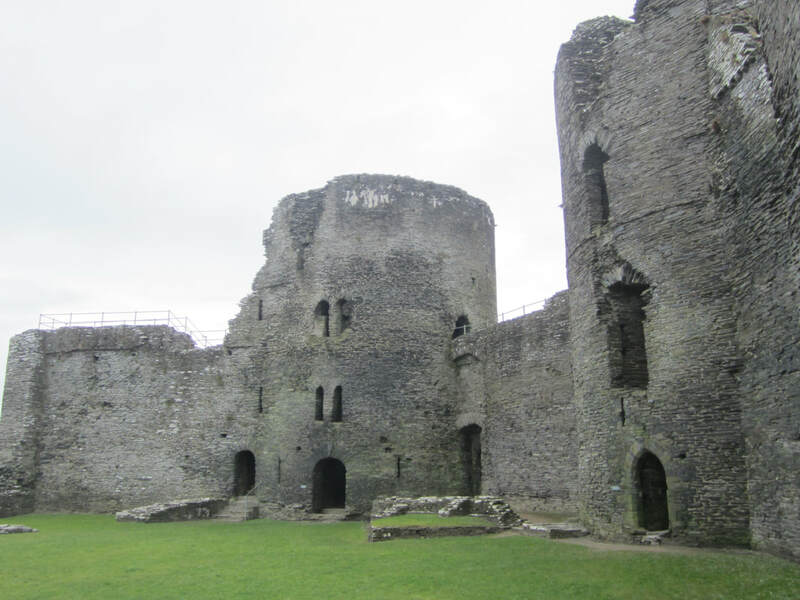 Originally in Cantref Emlyn and under the control of the Welsh princes, Cilgerran came under Norman control, but the Welsh under the Lord Rhys regained control and held it between 1164 and 1223. By 1204 the town was beginning to grow, with 22 taxpayers recorded in around 1220. In 1223 William Marshall, Earl of Pembroke, sent the Welsh princes packing, and his heirs ruled until the late 15th century. The Lordship of Cilgerran was established and administered until it became the Hundred of Cilgerran in 1536. It was a marcher borough; George Owen, Lord of Kemes, described it in 1603 as one of five Pembrokeshire boroughs overseen by a portreeve. Although the town remained small it was considered one of the main market centres in Pembrokeshire in the early 17th century, with mainly Welsh demographics. 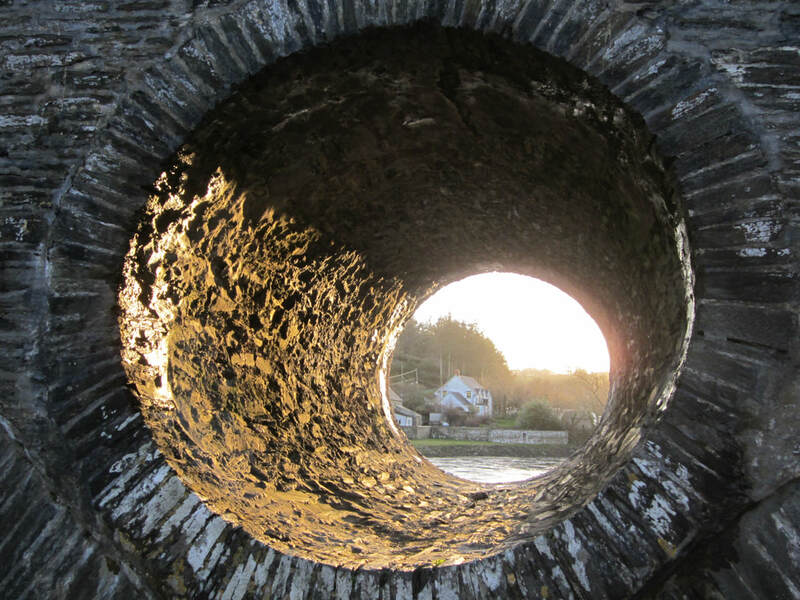 The principal occupations throughout Cilgerran's history were farming, salmon fishing and slate quarrying. Most slate was quarried in the Teifi gorge, and many of the houses in the town were built from this stone. 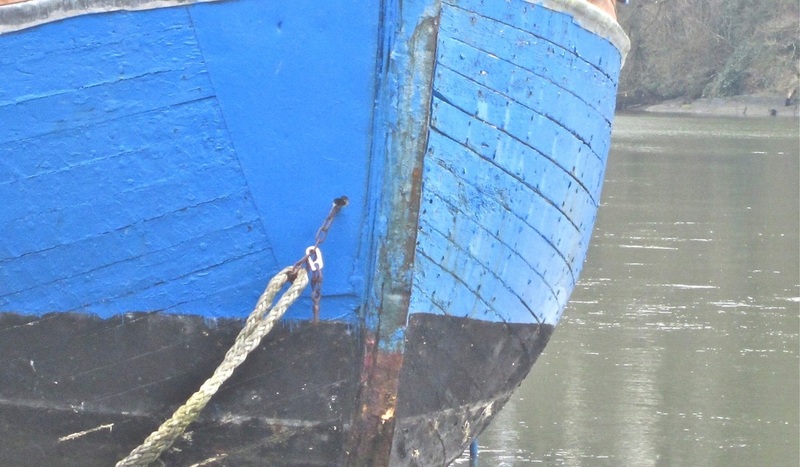 The town was renowned for the quality of the slate carried by river barge and exported through the port at Cardigan. The industry peaked in the late 19th century, partly supported by the coming of the railway in 1869. The town's market ended in the early 20th century, there was no further quarrying after 1936. The form of the present castle may well reflect that of an earlier earthwork castle. The headland is cut off by a bank and ditch which encloses an outer ward, probably the original bailey. The ditch can still be seen. Some 20m beyond the outer defences, a deep rock-cut ditch encloses the inner ward, which William fortified in stone with two formidable round towers and a strong gatehouse. The round towers are the most impressive feature of the castle ruins, which are open to the public. This small hamlet is strung out along the Cardigan - Haverfordwest road, not far from Brynberian. 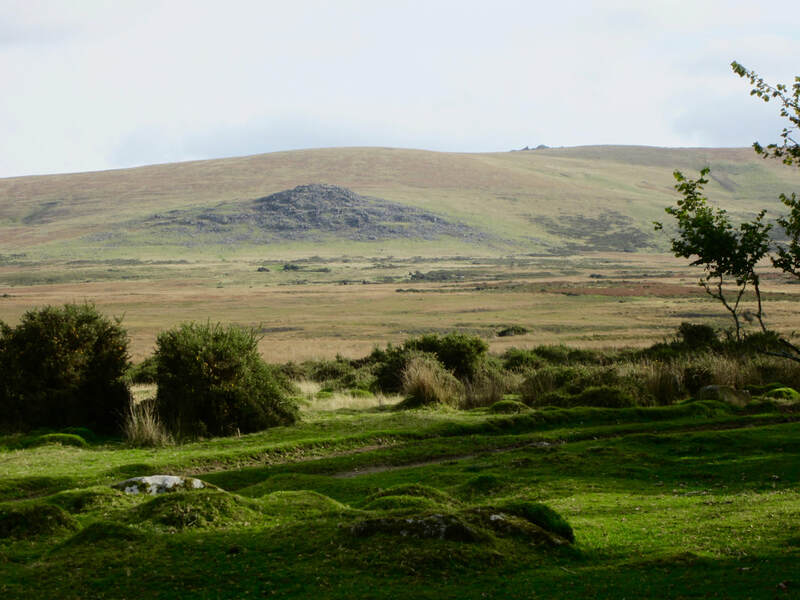 Towards the south, there is a special historic landscape which lies along the northern fringe of Mynydd Preseli. It consists of small, irregular fields, dispersed farms and cottages and winding lanes. 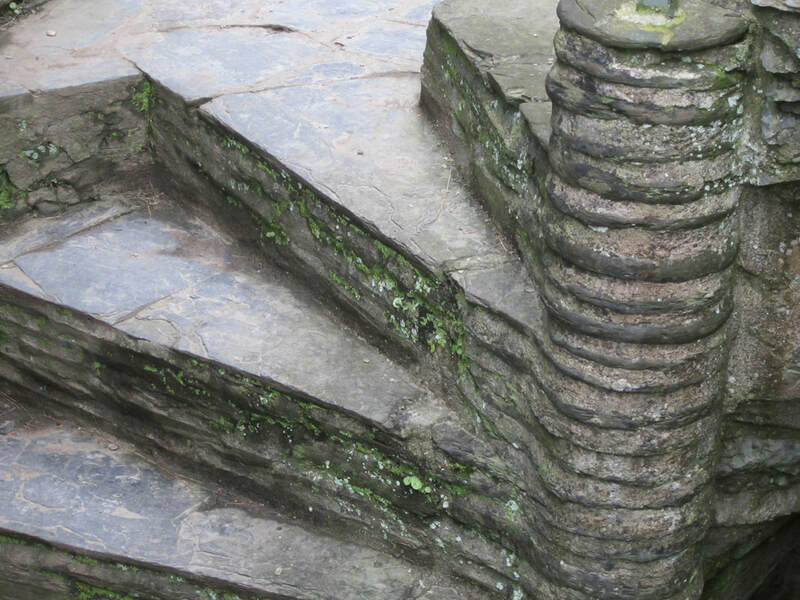 Stone is the traditional building material. Boundary banks are stony and topped with hedges. Land-use is mostly improved pasture, but with pockets of rough, wet ground. If you take the minor road southwards you come out onto the edge of the common; this is in my view one of the most charming landscapes in the whole of Pembrokeshire. Here, every year since 1977, the 5-mile fell race called Ras Beca has been held, in celebration of the Rebecca Riots. The race, always held towards the end of August, attracts about 100 runners each year, from all over the UK -- and there is a children's race as well. ​The name Crymych translates into English as "crooked stream", referring to the River Taf which rises in the high ground above the village and takes a sharp turn in the valley at the north end of the village. First mentioned in 1468, Crymych has for centuries been an area of livestock farming. Other than the Crymych Arms public house (dating maybe from 1812), little existed at the spot before the extension of the Whitland and Taf Vale Railway to Crymych in 1874. The community then grew rapidly as a service and transport centre for the surrounding uplands; and it acquired a reputation for being "the Wild West of West Wales", reflected in the tongue-in-cheek appellation of Cowbois Crymych by which residents are sometimes known. As far as the people of South Pembrokeshire were concerned, Crymych was populated by "the mountain men." A regional livestock market existed in the village for many years; a new purpose-built site was developed north of the village, also accommodating a number of other traders. 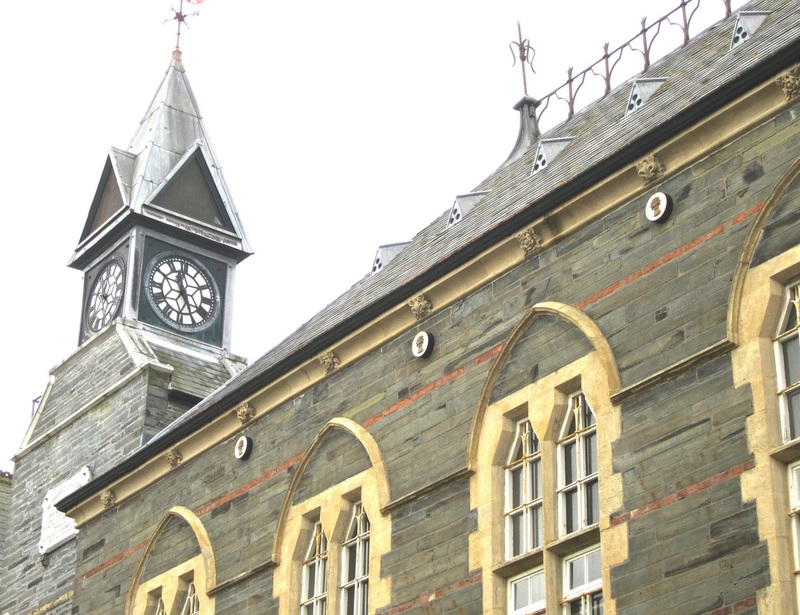 Crymych Market Hall was opened in 1919; with a present seating capacity of 250, it was built as a result of the formation of the Market Hall Company Ltd in 1911. 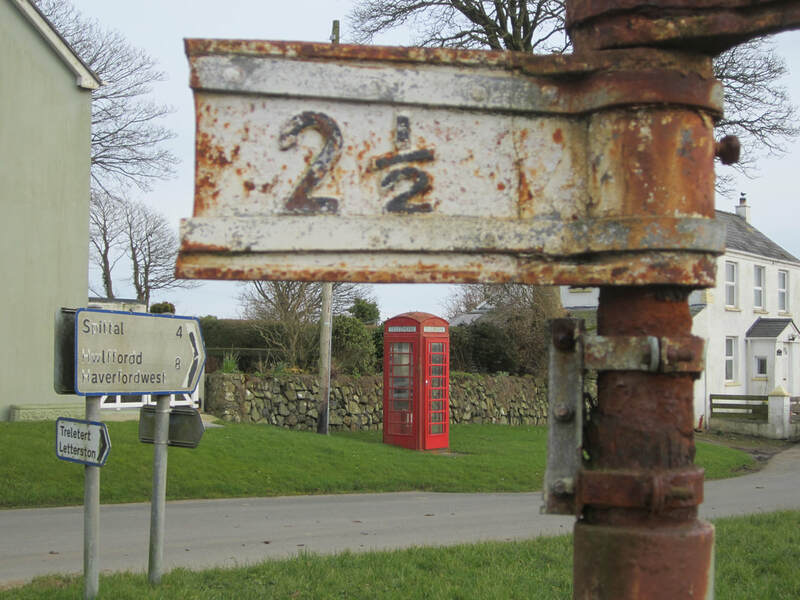 During World War 2 it functioned as an evacuee centre, a shooting range for the Home Guard and a social centre for American troops stationed locally while they trained in the Preseli Mountains. 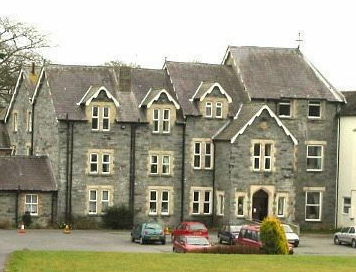 Crymych's status as 'capital' of the Preseli was confirmed in 1958, when Ysgol y Preseli secondary school was opened. In 1996, it became Pembrokeshire's first Welsh-medium comprehensive school and the number of pupils on its roll has doubled since its launch. In spite of a large influx of English immigrants to the area since the 1970s, Crymych retains a strong identity based on the Welsh language and Welsh culture. An elongated village strung out along the coast road between Newport and Fishguard. It's beautifully located between the upland of Mynydd Dinas and the sea. There are three easily accessible beaches, Cwm yr Eglwys, Pwllgwaelod and Aber Bach (Hescwm). Brynhenllan is a connected cluster of houses on the road to Pwllgwaelod. There is much of archaeological interest in and around Eglwyswrw community, and the village is recorded from Norman times; on the west side of the village is a small Norman motte. The site where the church now stands may have been sacred in pre-Christian times. The churchyard is raised, and roughly circular in plan, and it has a surprisingly irregular and hummocky surface, suggesting that there may have been Bronze Age burial mounds here. The first Christian church dates back to before the 8th century, and there was a later Norman church, the earliest record of which is in 1291. The current church (on the same site) is surprisingly large, and almost entirely late Victorian in age. The village hosted several important fairs, including Meigan Fair, at least as early as 1794. In 1895, following the death of local landowner W. Mathias, property and land covering nearly the whole of the village was auctioned in 16 lots for a total sum of nearly £7,000; some of the property, which included two pubs, the Butchers Arms and The Plough, was bought by tenants. The Serjeants Inn, now a private residence, was a Grade II listed public house dating back to the 17th or 18th century, so named because the Cemais Assizes were held there. It closed in the 1990s. 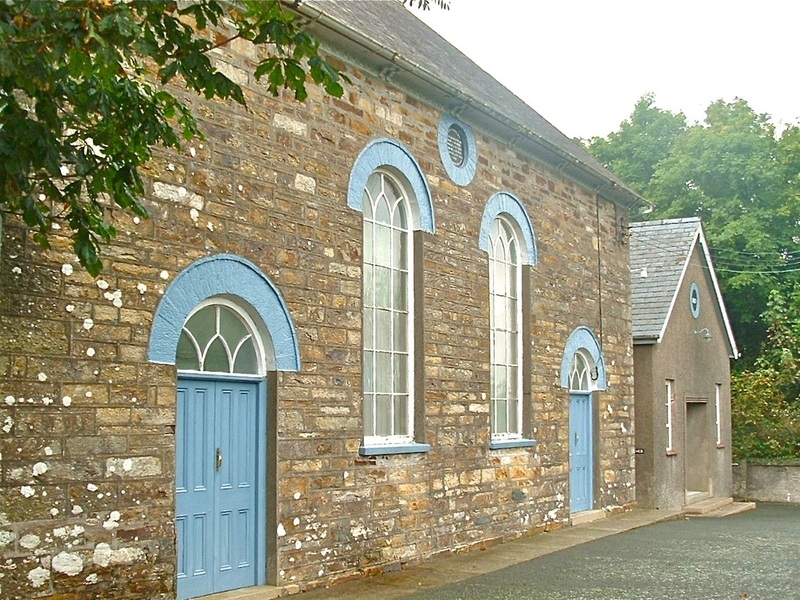 To the rear of the inn is a former meeting house which served as a chapel and a school in the 19th century. The Butcher's Arms, the village's other pub (now closed), featured in a 2004 Canadian Visa campaign highlighting difficult-to-pronounce place names around the world. There was irony in the fact that the pub did not accept Visa cards. The village shop and Post Office closed in 2009. In January 2016 Eglwyswrw was judged to be the wettest village in Britain for 92 years, having suffered rainfall on 85 consecutive days since 26 October 2015. Everybody was very disappointed when it stopped raining five days short of the British record. This little hamlet (which would be called "Knight's Milton" in English) must have had a mll at one stage, but who the knight was is something of a mystery. Maybe the Knight's Hospitallers had a property here, on the old pilgrim route towards Nevern and St Davids? Anyway, this is a beautiful location, on the Afon Nyfer and on a junction of three roads -- one leading towards Eglwyswrw, one towards Newport, and one (up a steep hill) towards Moylgrove. At the bottom of the hill, close to the junction, is a small cattle pound. Nearby is the Salutation Inn, a listed building called "Yr Hen Capel" or 'the old chapel", Cana nonconformist chapel with a front facade made of beautiful blocks of spotted dolerite "bluestone", and a fine Tudor building known as "The College". There was a building here in Elizabethan times, and it has variously been used as a court house and as a school. It was modernised in 1852 by the Lord Marcher of Cemais. 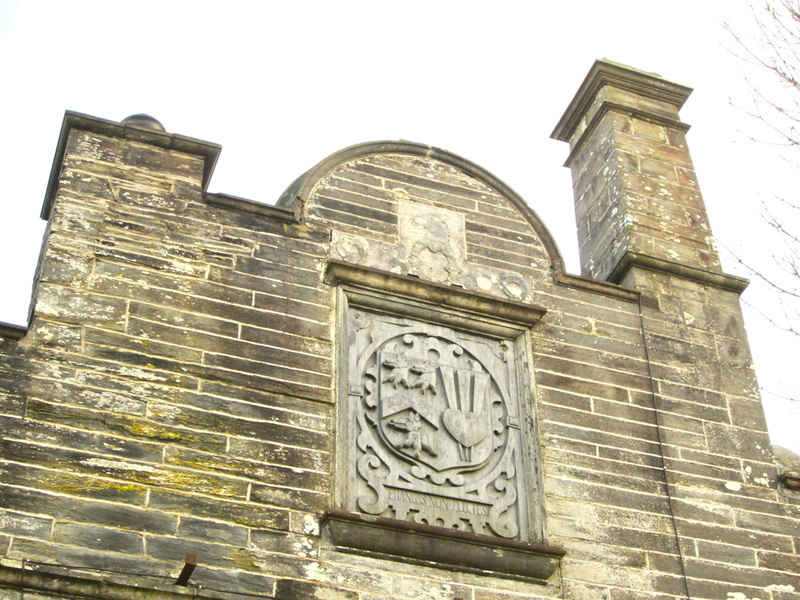 It was originally connected to the nearby manor of Henllys, home of the eccentric historian George Owen who wrote the famous 1603 book called "The Description of Penbrokshire." Goodwick (Wdig) lies immediately west of its twin town of Fishguard. The coasts of Wales were subjected to Norse raids during the Viking Era and, in the latter 10th century, Norse trading posts and settlements became established. 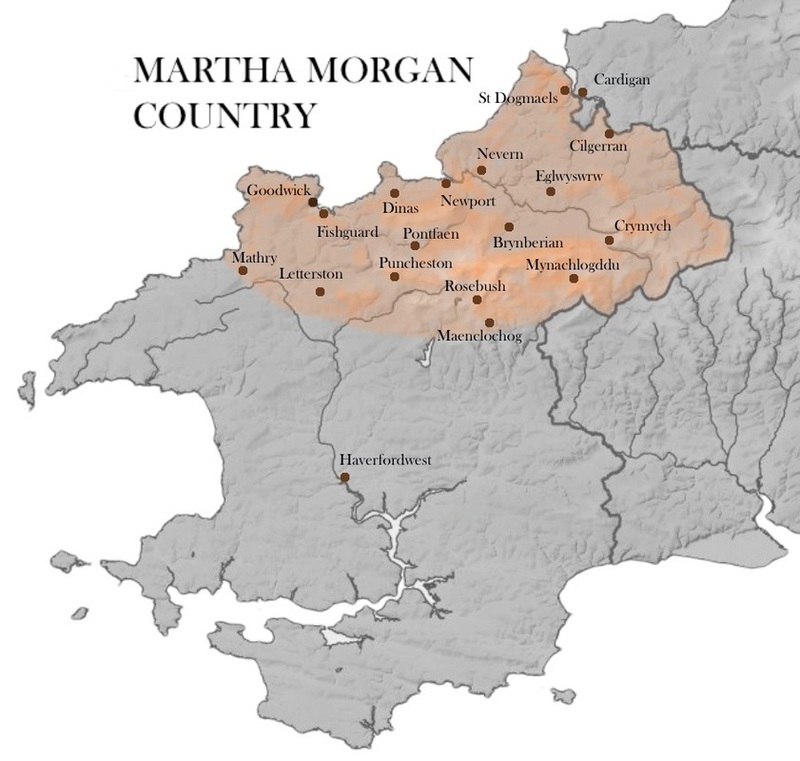 The place name probably derives from a combination of the old Norse forms. Goodwick was originally just a small fishing village in the parish of Llanwnda, but in 1887 work commenced on a railway connection and harbour, and the village grew rapidly to service this. The main industry is now tourism although in the town's industrial past brick making was once an important industry. Some fishing still takes place on a small scale. The local beach, Goodwick Sands, is where the defeated French invasion force assembled prior to their unconditional surrender on 24 February 1797. In "On Angel Mountain" Martha's husband David finds himself in Goodwick when he joins the irregular forces combatting the French. The harbour was constructed by blasting 1.6 million tonnes of rock from the hillside to make a 900 m long breakwater. The quarried-out area became the quay, with ample space for railway sidings. The harbour was finally opened on 30 August 1906. Planned to be the end of the Great Western Railway's line and its major Atlantic sea port, replacing Neyland, silting problems within the harbour prevented larger ocean liners from docking. Nonetheless, the Great Western Railway ordered three new steamers for its service to Rosslare, St David, St George and St Patrick. RMS Mauretania visited once in 1909 although passengers had to board by tender when transferring to and from the London train. A smaller breakwater was built as part of the preparations for the visit of the RMS Mauretania and it is sometimes known as the "Mauretania Mole". The breakwater led to even more silting, and the prospect of future visits from larger liners was abandoned. Directly above the harbour is a small estate known as "Harbour Village", built to house workers during the construction of the harbour. The port now accommodates a Stena Line ferry service to Rosslare. The RNLI operates an all weather Trent class lifeboat, the Blue Peter VII, and a class D inshore lifeboat from within the harbour. In October 2011 plans for Fishguard & Goodwick Marina were revealed, but the economic recession has held up work on the project. ​There is virtually nothing left of this "lost village" apart from a farm and a couple of houses, and the local council has not even bothered to put up road signs to tell you that you have either arrived or departed. The Victorianised church and churchyard are on a spur high above a deep wooded valley that runs down towards the "lake" of Llysyfran Reservoir. The landscape hereabouts is not often visited by tourists, but it is very beautiful. Below the churchyard there are traces of an Iron Age fortified settlement, and there seem to be at least two other earthworks in the vicinity. There was also reputedly a healing or holy spring (called Bernard's Well) which used to attract pilgrims. ​Letterston is a long stretched-out village which has grown bit by bit as a result of ribbon development. But it does not follow the main A40 road -- rather, it runs perpendicular to it, with one part on the road to Castlemorris and the other on the road to Little Newcastle and Puncheston. 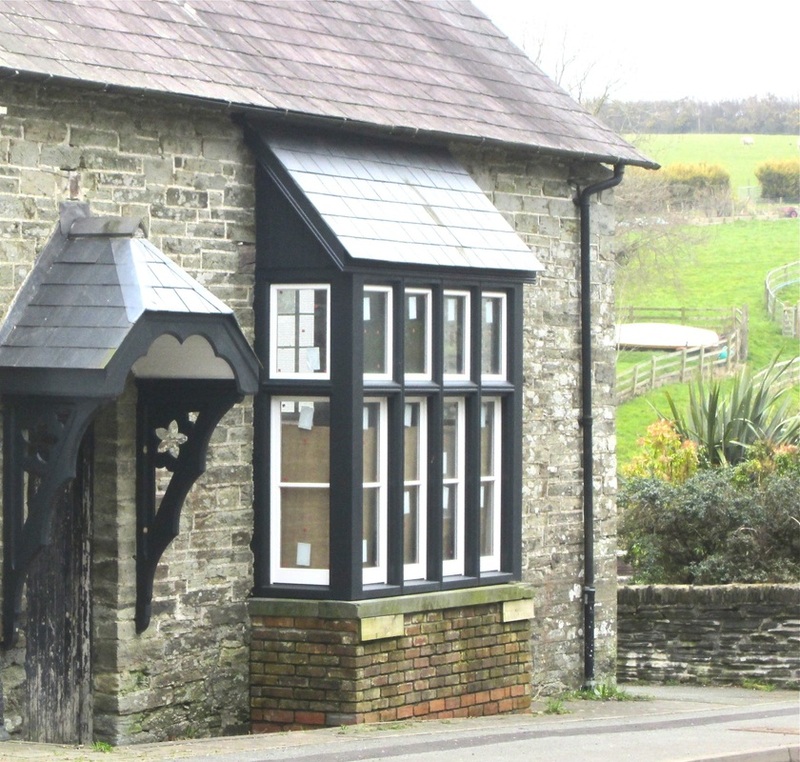 Because of its easy access to Haverfordwest and Fishguard, there has been a lot of recent growth in the village, and it maintains a range of services which most other smaller villages have lost. There was once an important railway junction here, where the GWR joined the older North Pembrokeshire and Fishguard Railway. The main platforms and sidings were at the eastern end of the village, and are now almost lost except for those with a practised eye. The church is Victorianised (1881) and somewhat austere, with surprisingly small windows and a minute bellcote containing a bell that has to be rung by pulling a rope on the outside! 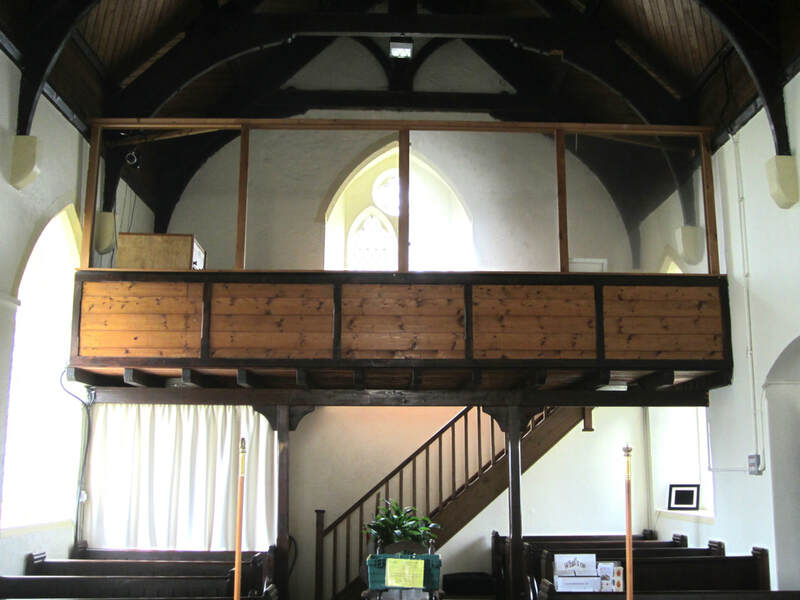 Inside, there is a bit of a surprise -- a wooden balcony at the end of the nave, reached via a wooden staircase. 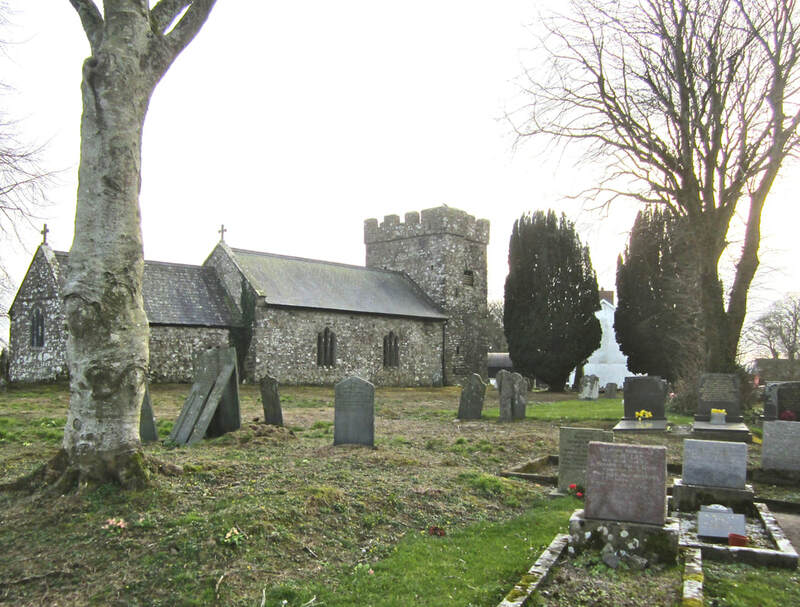 ​A small village (Casnewydd Bach) not far from Letterston, chiefly notable for its extensive village green. Although there are a number of new buildings, it appears that the village has fallen on hard times, and there is no longer a village shop. 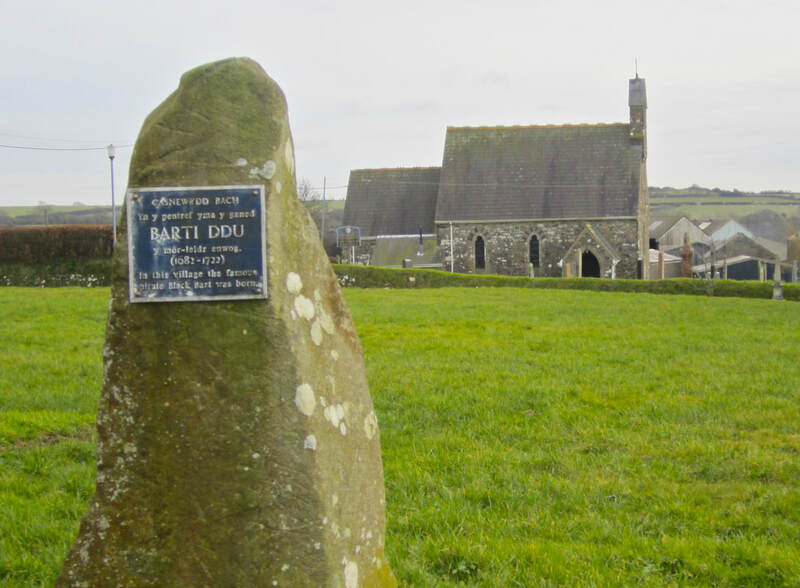 The famous pirate named Barti Ddu (Black Bart or Bartholomew Roberts) hailed from these parts, and he is commemorated on a memorial stone on the edge of the green. He lived from 1682 to 1722. He was one of the most successful pirates of all time, taking over 470 vessels as prizes and accumulating a vast fortune in the process. He is reputed to have invented the Jolly Roger or joli rouge -- and like most of the swashbuckling pirates of the time he enjoyed a short life and a jolly one, until the Royal Navy caught up with him off the coast of Africa. We might as well call this one of Pembrokeshire's "lost villages" since there is nowadays a parish church and a trace of a village green, but just a scatter of cottages and farms as a reminder that there must at one time have been a distinct cluster of dwellings in this exposed and remote place. Some people believe that there are traces of prehistoric stone settings on the green. 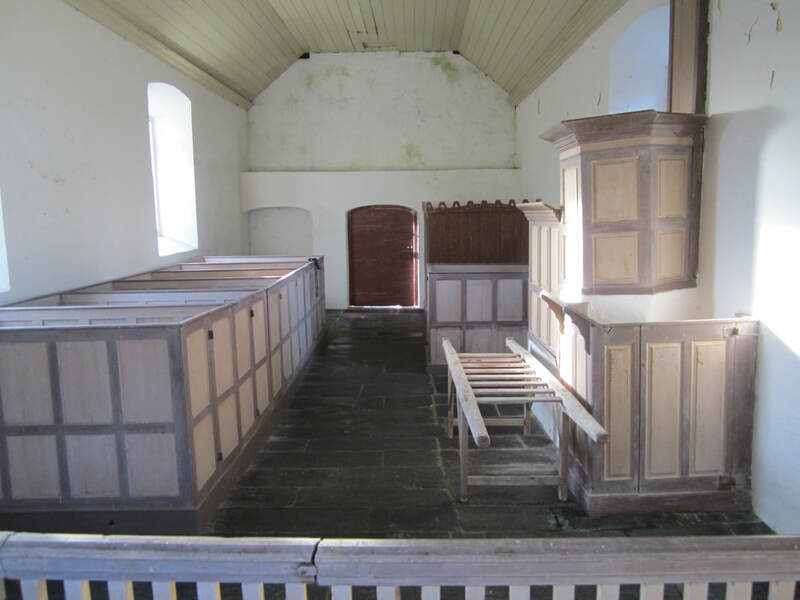 The church is a typical "Welshry" bellcote church with a simple interior, and it has been changed many times over the centuries, There was a church here before 900 AD, and Asser, a friend and advisor to King Alfred, was educated here. Giraldus Cambrensis, the Welshman who never did become the Bishop of St Davids, was rector here for a time. 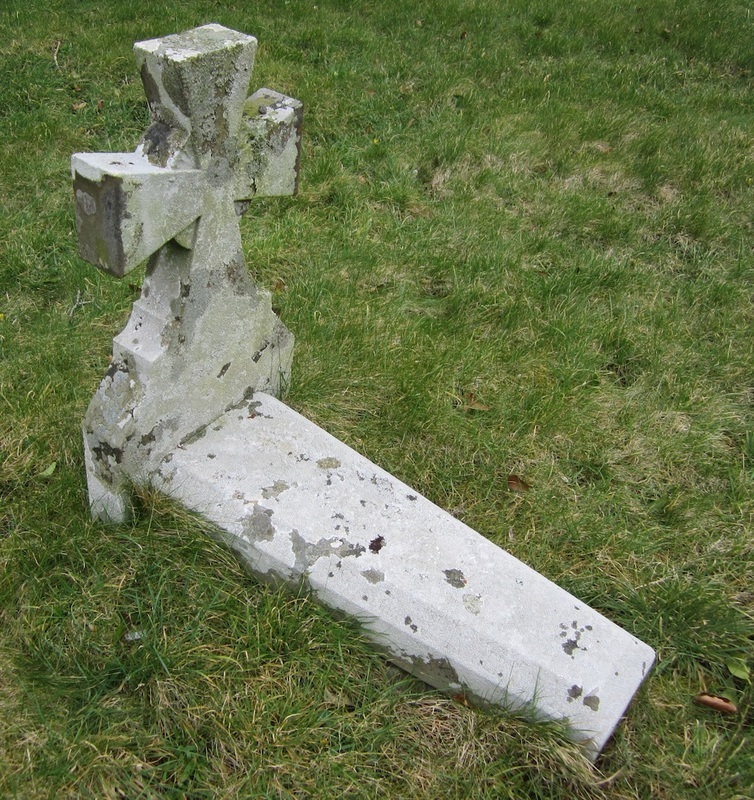 The church was substantially rebuilt in 1881, and there are a number of inscribed stones built into the structure. In February 1797 there was a good deal of activity hereabouts, during the short-lives French Invasion. The rocky crag near the church was one of the strongpoints and lookout points used by the rabble of French troops before they lost interest in the enterprise and surrendered on Goodwick Sands. Llanychaer is a village made up of several segments, towards the western end of Cwm Gwaun. At one time it served a substantial farming community, favoured by relatively good access from all points of the compass. Traces of an old mill can be seen adjacent to the road. Up above the valley stands the old mansion house called Cwrt, which is currently in the process of renovation. This house features in the later Angel Mountain stories as the home of the eccentric ex-industrialist named Wilmot Gwynne, and his even more eccentric wife Delilah. 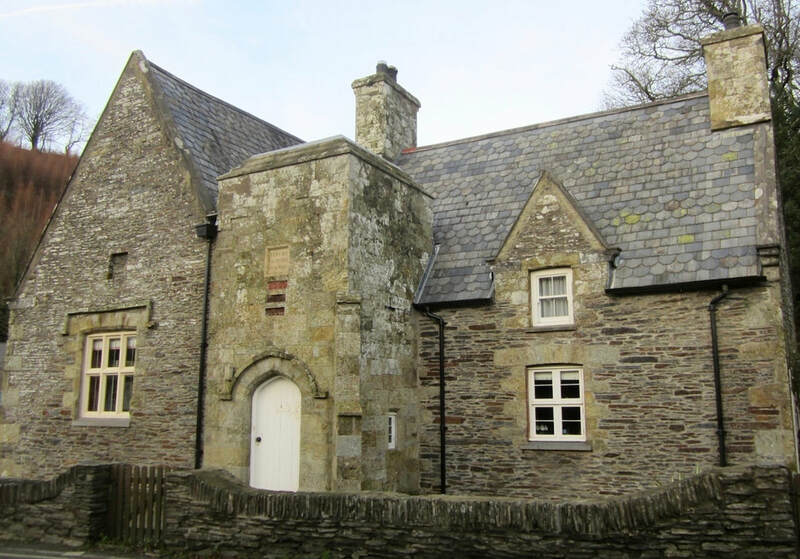 At the bottom of the hill is a pretty whitewashed gatehouse linked to Cwrt, and now used as a holiday let. At the other end of the village, near the junction leading into the deeply-cut Nant y Bugail channel, the old farmhouse of Garn is in an idyllic location, nestled among rocky gnolls, grassy banks and copses of mature trees. 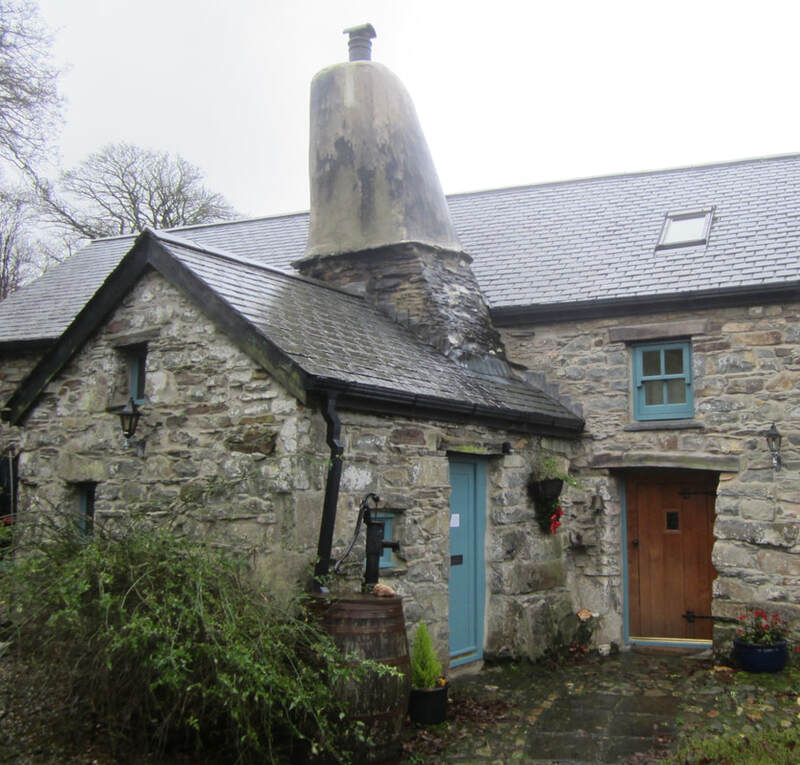 The farmhouse has one of the best-preserved "Flemish chimneys" in Wales -- but don't imagine that its building had anything to do with the Flemings, because it didn't. 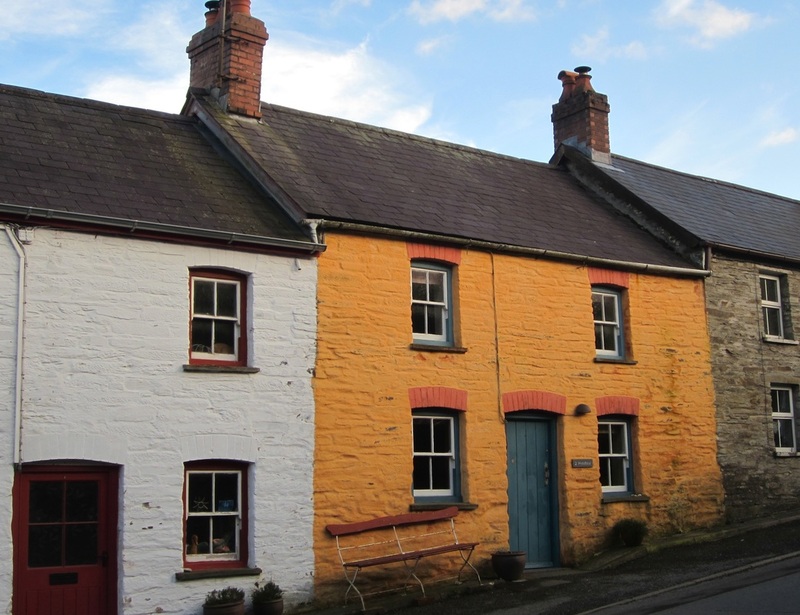 This small village on the road between Cardigan and Cenarth has grown and survived partly because it is adjacent to one of the most important bridging points on the River Teifi. This is the highest point reached by the tides. Llechryd Bridge is a miracle of bridge-building, since it is regularly battered by massive quantities of flood waters, tree trunks and branches, and all too often completely overtopped by the river in flood. Sometimes even the bridge parapets disappear beneath the swirling waters. Much of the early growth of the village was associated with the developments at Coedmore or Llechryd Forge in the seventeenth and eighteenth centuries, on the Cardiganshire side of the river. The forge became an ironworks, fed with imported pig iron, limestone and other raw materials and smelted with charcoal derived from abundant supplies of local timber. The ironworks ceased production around 1750, and after that the Penygored Tinplate Works rose to prominence on the Pembrokeshire side of the river, under the ownership of Sir Benjamin Hammett. All in all, the forge, ironworks, and tinplate works must have required a substantial workforce, and other employment was provided for those who dug out the leat which ran downstream from near Llechryd Bridge and those who operated the sailing vessels and barges which brought in the raw materials and exported the finished products. So Llechryd, somewhat surprisingly, must have been one of the earliest "industrial" villages in Wales, predating by a century most of the other coal mining and ironworking settlements that grew up during the Industrial Revolution.